A recent all-terrain vehicle (ATV) accident left a 23- and a 24-year-old in the hospital. Both men involved in the ATV accident were from Massachusetts. The accident happened when their ATV struck an embankment on Greenwood Brook Road in Maine and flipped over, according to the Morning Sentinel. Unfortunately, young and inexperienced riders are more likely to be involved in an ATV accident in Massachusetts and elsewhere through the summer and fall months. Our Boston personal injury attorneys understand how serious these types of accidents can be. In this particular accident, one of the Massachusetts riders was trapped underneath the ATV as it flipped. The rider was transported by Northstar EMS to Franklin Memorial Hospital in Farmington. We’re thankful that both riders were wearing their helmets at the time of the accident otherwise injuries could surely have been fatal. According to AVTSafety.gov, there were more than 615 reported deaths resulting from ATV accidents in 2008. Officials believe that number to be much higher as they predict that not all accidents were reported. Officials believe that number to be much closer to 800 than 600. There were also more than 135,000 injuries reported as a result of accidents involving ATVs. “As nurses who initiate immediate care to patients admitted for ATV injuries, the sorrow and pain of parents and family members of ATV victims is heart wrenching. If stronger regulation of ATV safety would save the life of one young child, it would be worth it all” said Linda Altizer, RN, from the National Organization of Orthopedic Nurse‘s Board of Directors. -Enroll in a safety course. Many hands-on courses are offered and can teach drivers about a number of situations a rider can expect to encounter. Drivers who complete a safety course are less likely to be involved in an accident. -Make sure you’re wearing your gear. Riders are urged to wear a helmet when riding. The more gear your wear, including gloves, a jacket, goggles, proper pants and above-the-ankle shoes can significantly reduce your risk of being injured. -Don’t ride with passengers. More than one rider on an ATV greatly increases your risk of being involved in an accident. Most ATVs are made to only carry one person anyway. Drivers must be able to shift their weight in any direction at any time, passengers make this much more difficult. -Don’t drive on paved roads. 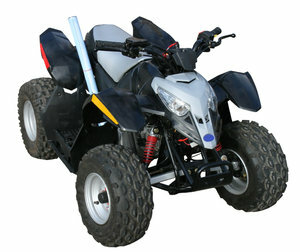 Because of the design of ATV, most of them are difficult to handle on paved roadways. A great number of fatalities occur in this area. Collisions with cars oftentimes turn deadly. -Don’t allow children to drive. Children represent a third of all ATV-related deaths. Most of these fatalities occur when a child is driving an adult ATV. Riders under the age of 16 are twice as likely to be injured as those in any other age group on an ATV. If you or your child has been injured in a Boston ATV accident, contact Boston Accident Attorney Jeffrey S. Glassman for a free and confidential appointment to discuss your rights. Call 877-617-5333.